BlueSky Fitness is an Austin, Texas based company that services personal training programs and on-site group fitness programs such as boot camps and Yoga for Austin Independent School District Employees. 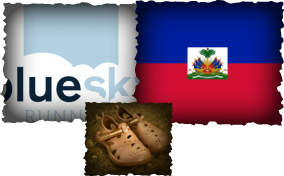 BlueSky donates one pair of shoes to The St. Etienne School in Haiti for each Fitness program that is purchased. Our goal is to supply each individual at St. Etienne, students and faculty, with a pair of shoes each year. 250 in total. We achieved and exceeded our goal in our first year, 2015 bringing over 300 pairs of shoes to St. Etienne! Our goal is in future years, once we have a sound system in place, to look into expanding to other destinations and into other forms of support. St. Stephens Episcopal School is the school where the founder of BlueSky, Lorin Wilson, used to coach distance running and basketball, in addition to operating BlueSky Fitness St. Stephens, through raising money from students and faculty, built St. Etienne in 2003. Students and faculty continue to visit a few times each year to help out with continuing development of the school and the surrounding areas. They provide educational opportunity, shelter, and water for the sister school. Millions From One has the clear vision of providing sustainable solutions that meet the basic needs of life, build community, promote education and provide hope to the hopeless all over the World. They believe every life has great value. to save millions of lives by providing long-term clean water and antimicrobial shoes, along with education and hygiene training, to those most in need across the World.